Beverly’s is one of the longest continually operating restaurants in Oklahoma City, and in fact was one of my favorite restaurants when I was growing up. I think their fried chicken, pancakes, and other popular items served as my version of fast food–something that was a special treat but it was not so expensive that my dad would have to severely limit the number of times we went. For many years Beverly’s was a chain, with the restaurant at Northwest Highway (before it became an “Expressway”) and Pennsylvania Avenue as the one with which I was most familiar. This was known as Beverly’s Chicken In The Rough, a restaurant that specialized in pancakes and fried chicken in the days before these two items were put together and served in the same meal. As a restaurant/diner/coffee shop that is now open 24 hours a day and may have been then as well, it tried to satisfy people’s appetites at different times of the day. There was actually a wide range of good items, and not just pancakes or fried chicken. Sometime after 2000 I remember the restaurant on Northwest Expressway being the only one left and rumored to be closing, but it then moved to its present location with what I assume to be new owners. I was not a regular enough customer to say that the new restaurant is exactly the same as before, but I know that it has kept the same concept. Beverly’s is probably most popular at breakfast, but it offers what people would expect in a coffee shop. I was able to try the Pancakes at the new Beverly’s, and I can report that they are still good. In fact, as one of the few dishes I can successfully prepare at home, the pancakes in restaurants are increasingly becoming a disappointment to me (mainly because of the cooking oil they use). 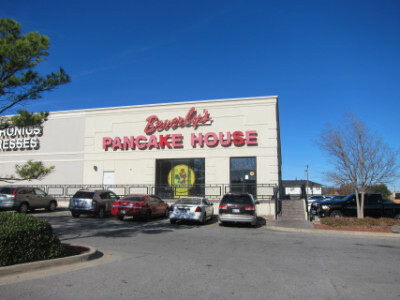 I thought everything about the flavor of Beverly’s pancakes, including the oil, were good. As a restaurant that is open 24 hours and open on holidays, I found out that it also has a special menu on certain holidays. This includes a special Thanksgiving meal which includes most of the items I used to find at the now-closed Luby’s Cafeteria. Compared to the majority of times I had Thanksgiving dinner at Luby’s, though, I found Beverly’s to be better. I will start by reporting that on my visit in 2017 the Thanksgiving Dinner was $12.99 (I believe this did not include the drink or dessert). 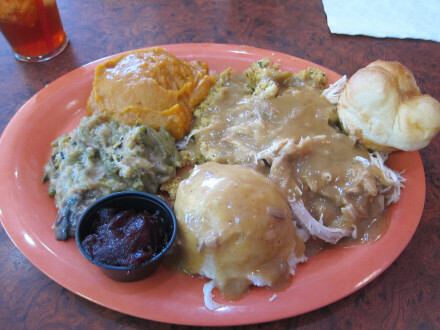 Everything on the plate was good, and the turkey, mashed potatoes, and gravy were the items that I particularly thought were better than at Luby’s (they all tasted home made to me although I am not going to say they were exactly the same as if you cooked it yourself). 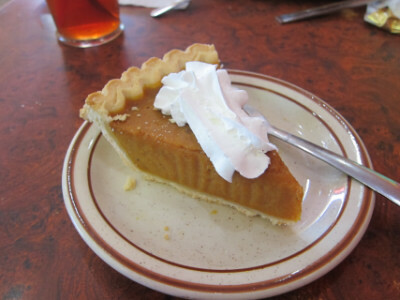 The sweet potatoes, dressing, and pumpkin pie were on par with Luby’s, and are items I particularly liked at Luby’s as well as here. The green beans were good but I would say not special or memorable. The main thing I can say about the Thanksgiving dinner is that they made a good effort, and I thought everything was good. The restaurant was busy when I went but not crowded, and we were served promptly. The Pumpkin Pie was pretty much the way I like it. Beverly’s has a large pie case with multiple flavors, and I assume ones like pumpkin are seasonal. I am aware that any restaurant open 24 hours per day is going to have different shifts, different managers, and probably different qualities of food at various times. Beverly’s is what I would classify as a diner, and even though I thought the food was good, the restaurant is very casual. The old Beverly’s was the definition of a 1960’s coffee shop with what seemed to include the requisite amenities (I do not remember all the details but I think it included things like baskets of jellies and other condiments on the table, better than average seating and decoration, a view out the front window to a landscaped patio, etc.). Some reviews I have read on other websites describe Beverly’s as not having the best food in Oklahoma City, but it is an old standby that is always there where you want it. I think this is a good description, and I would add that the food is better than much of which I would consider to be its competition. At the moment, though, I have only tried a small sample of the food here.